All those who think SOULFLY is now too monotonous, or KORN too compromising, need only look to SKINDRED and their latest album Volume (2015, Napalm Records) to bring what somehow seems lost from the Nu-Metal genre! Since 1998, the quintet from Wales, SKINDRED has been responsible for their own unique blend of Core, Dub, Reggae and Funk. This is the main reason that no leg is kept on the ground, no shirt dry, and no neck not stiff from headbanging. And with their sixth studio album Volume, there is absolutely no exception! This power crossover formation has now released a full European headline run with special guest ZEBRAHEAD. 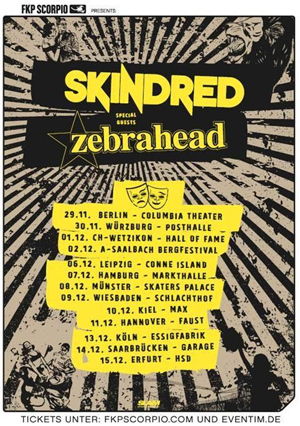 "SKINDRED and ZEBRAHEAD have had a long history as friends and this will be the 1st time in that history that we can tour together. This is will certainly be a party tour so pretox your livers and get your dancing shoes on! Germany has some of the best crowds in the world and this is the most extensive German tour we've ever done. We are so excited to "Pump up the Volume!" With its massive Nu-Metal style guitar shredding, grooving beats, dub and electro inserts, and the vocal diversity of frontman Clive "Benji" Webbe (ex-DUB WAR), these islanders continue to hit hammer, anvil, and stirrup mercilessly with songs like Volume's title track, as well as "Under Attack" and "Hit The Ground". There are numerous hits waiting for you to be heard on this tour! "Some maybe exiting Europe but we are entering to bring the best party energy and the feeling of unity, love and togetherness to all of our European Brothers and Sisters. Book of Saint Benji Verse 3 chapter 8. This music's our salvation! You cannot capture this on YouTube in your bedroom alone it cannot capture what SKINDRED does live you have to be there!"